Step 1: independent contractor or employee? Independent contractors and employees are not the same, and it's important for employers to know the difference. Knowing the difference is critical for tax purposes and for helping your business avoid costly legal consequences. The main difference is the degree of control that an individual exerts over his/her work. Independent contractors have a high degree of control over the work they do, the hours they work, the supplies they use, will simultaneously work for multiple employers, and advertise their own business. In contrast, employees typically exert less control over their work, have duties assigned by the employer, are giving training for the work being performed, and typically only work for one employer at a time. Misclassification of an individual as an independent contractor can have a number of legal & financial consequences. The Form W9 is an official IRS form that employers give to employees and/or independent contractors for the purposes of obtaining their name, mailing address, social security number, and/or tax ID number. 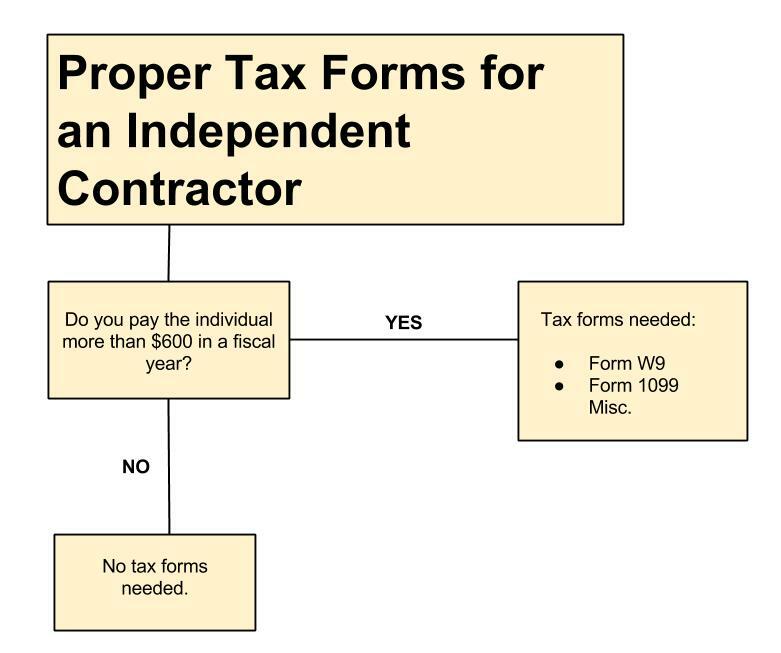 If you file any tax forms on behalf of your employee or independent contractor, you need them to fill out a Form W9. You can find the Form W9 here. When you pay an independent contractor less than $600, there are no forms to fill out. You will not need to have the individual fill out a W9 because you are not filing any tax paperwork where you would need the information contained in the W9. Independent contractors making more than $600. When you pay an independent contractor more than $600, you must file a Form 1099 Misc. with the IRS and give a copy to the independent contractor by January 31st of the following year. No other forms or taxes are owed. Because you must file a Form 1099 Misc., this means that you need the information provided on the W9, so the independent contractor must also fill out a W9. For independent contractors that make more than $600, you will receive a 1099 Misc. form from your employer. Your employer will have sent this document to both you and the IRS. When you file your taxes, you will not directly file the 1099 Misc. Instead, you will use the information reported on the 1099 Misc. form to fill out your tax return.